In the bowl of your stand mixer, add the 1/4 cup of cold water. Sprinkle the unflavored gelatin over the water and let the gelatin soak. Cover a 8x8" square baking pan with plastic wrap and spray the plastic wrap with nonstick spray; set aside for now. Mix the sugar, corn syrup, and 2 tablespoons water in a small saucepan. Place over the stove and bring to a boil. Boil hard for 1 minute. Pour the boiled sugar syrup into the stand mixer bowl over the gelatin. Add salt. Mix on high for 12 minutes. Add vanilla and mix a few more seconds. 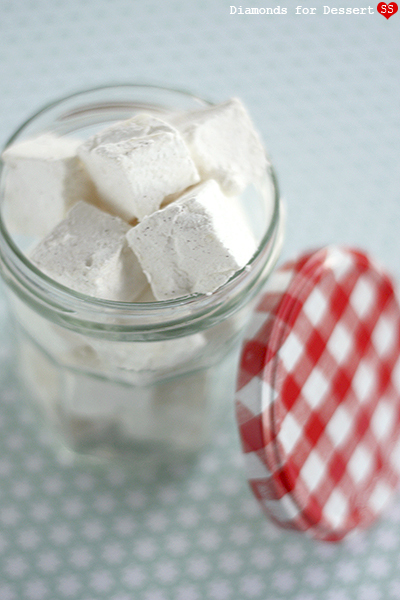 Use an oiled spatula and scrape the marshmallow mixture into your prepared square baking pan. 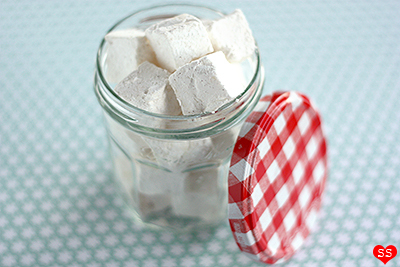 Spray a sheet of plastic wrap with nonstick spray and place over the marshmallow mixture, greased side down. Press on the plastic wrap to smooth out the marshmallow. Let set for a few hours. Once ready to cut, in a wide bowl, mix 1/2 cup powdered sugar with 1/2 cup cornstarch and add the pinch of cinnamon if desired. Peel the plastic wrap off the baking pan. 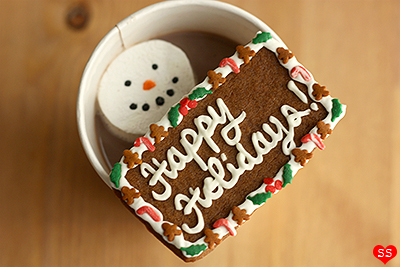 Move the marshmallow over to a cutting board and cut into squares with a knife sprayed with nonstick spray. 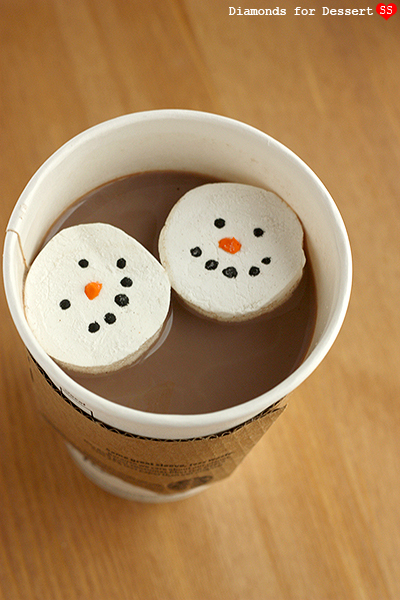 (If you want to make snowman marshmallows, use a round cookie cutter sprayed with nonstick spray to cut out circles.) 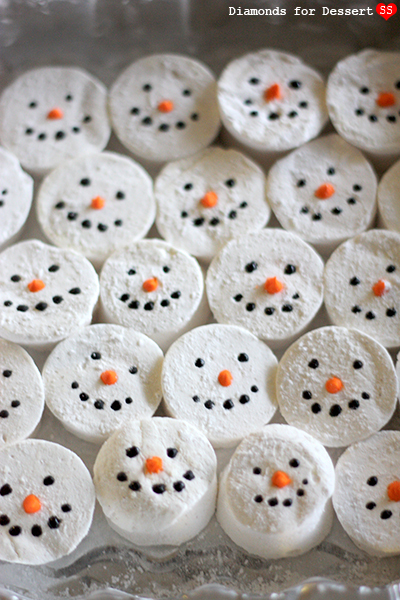 Roll the marshmallows in the powdered sugar/cornstarch mixture as you cut them out. Once all are cut, keep in an airtight container until ready to serve. NOTE: Above measurements are halved from original recipe. Feel free to double recipe for thicker marshmallows. Color half the royal icing black and half of it orange. Keep the orange icing covered when using the black icing first. Use a toothpick to dot black icing for eyes and mouths. It might not stick very well since the marshmallows are covered with powder, so press the icing into the marshmallows, sort of like inking a tattoo. Blob on orange icing for the noses, pulling the toothpick upwards so the icing is slightly pointy. 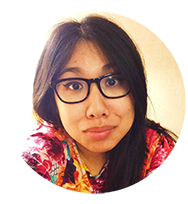 The fact that you are able to manage medical school in addition to this blog floors me. Props to you, I am so impressed. Oh and these look delicious! 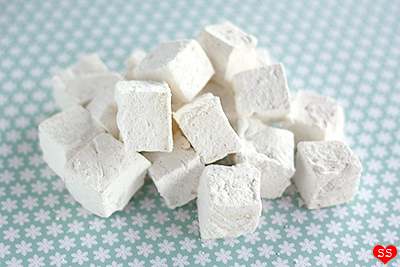 I never have made my own marshmallows from scratch before, thanks for the idea. These are so cute!